The UK may be a nation of gadget lovers but there is a growing throwaway culture, a survey has found. More than half of 16 to 34-year-olds expect to change products such as mobile phones and DVD players every three years. Only 2% will hold on to technology for more than five years, the survey found. Peer pressure plays a large part in what technology is fashionable at a given time with 54% of young people admitting to this influencing their buying. Tom Dunmore, editor of the gadget magazine Stuff, said there had been a change in the way people relate to technology. 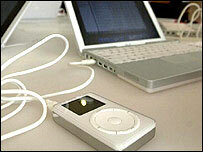 "Many gadgets nowadays have a built-in obsolescence," he told BBC News Online. The iPod is a case in point, he said. Although Apple has since changed its policy, the original music players had a limited battery life and users were advised to buy a new machine when the battery died. Companies such as Apple are moving from the computer into consumer electronics industry where there is much more emphasis on regular upgrades, pointed out Mr Dunmore. People might expect their TV to have a longer shelf life but even these are not guaranteed to last. "People don't realise that the first generation plasma screens, which cost about £5,000, will degrade over a five year period. Buyers will be distraught when they find out," he said. "Young people are much more happy to upgrade on a regular basis. It is much more about fashion than keeping hold of things," said Mr Dunmore. People over 30 are a little more circumspect he believes, with many hoping to cling on to their phones and other gadgets for up to 10 years.